My interest in geriatrics stems from working in a nursing home as a teenager however my exposure to palliative medicine happened during residency. During my training journey, I found that there were many instances where the two fields overlapped leading me down the path to become trained in both fields. Early on in my journey to combine these fields everyone was so supportive with comments like "that makes sense" or "what a great way to combine your interests". However, now I feel as if I need to choose one field or the other to maintain my own sanity. I mean, how do you even pick which conferences to attend each year? AGS? AMDA? AAHPM? NHPCO? My family says - pick based on the best locations! As a junior academician at an institution where geriatric medicine has a very nice structured home in the department of medicine and palliative medicine seems more nebulous, I have carved out a job where I continue to do both. Is this a sustainable existence? How do I balance my life along with balancing the dynamics associated with splitting my time between the two fields? Or is it just the perception that I am spending time in two different arenas? One of my colleagues like to say "good geriatric care is good palliative care". I have started to define myself as a geriatrician with expertise in palliative care. It seems to fit with who I am at the core and help me decide what opportunities to pursue. I am still learning the art of negotiation and how to say 'no' so to speak - aren't we all? I know there are others out there struggling with the same dilemma and thought that this could be a forum for discussion and support. Wonderful post. A related question is why should patients have to choose? While our discipline does not like to admit it, most of the practice of Geriatrics is Palliative. We have much more to offer in terms of improving the quality of life and well being of persons with the impairments of aging and geriatric syndromes than reversing those syndromes. I wonder if the care we provided as Geriatricians would improve if we were more willing to explicitely acknowledge this. I can sympathize with your position wholeheartedly. I, too, have faced similar choices throughout my career. My interest in older adult medicine stemmed from my family experiences and medical training. I eventually completed a geriatric medicine fellowship at Mount Sinai Medical Center in NYC where there was also a strong palliative medicine presence. Currently, I serve as the medical director for the palliative care program at Wake Forest Baptist Medical Center in North Carolina. To complicate matters, my program resides within the General Internal Medicine section, so my yearly choice of conference attendance (AAHPM, AGS, SGIM, NHPCO, etc.) is challenging. I was given the advice that you should stick with the organization(s) that you would most like to devote your time and energies in educational and leadership activities. For that reason, I have decided to devote my energies to AAHPM with attendance at AGS and other societies as time permits. I think the challenge is to not spread oneself too thin. Thus, I would define myself primarily as a palliative care specialist with heavy emphasis in geriatric medicine. Like you, there are many of us out there that face similar challenges. Given the current state of our healthcare system, it is an exciting time to be practicing what we do. I love this post. Agree with Ken that geriatricians provide palliative care whether we admit it or not. I also think that palliative care providers need to think of themselves as geriatric providers. 83% of patients on hospice are over 65. But think of the degree of anticholinergic meds on standing orders for hospice for example. We need Geriatric Palliative care providers. We can be the go between for 2 distinct groups. We can help the geriatricians (and primary care) focus on the palliative issues of caring for the aging, but we can also be the trainers for the palliative care about the special needs of the frail elder. The work of Christine Ritchie, the dialog between the leadership of AGS and AAHPM, and the prospect of payment reform excite me. We can do both. As Eric Widera likes to remind me, I am a doctor who likes caring for frail elders. I am a Palliative Care Geriatric provider. Thanks for sharing your thoughts about how you define your professional niche and identity. I totally agree there is a lot of overlap between geriatrics and palliative care. I've had similar but slightly different dilemma of explaining to people why I'm interested in geriatrics and palliative care...and HIV, developmental disabilities, and low-income populations such as homeless immigrants. For me I see those fields as very much similar in terms of patients' needs and professionals’ skillsets required -- providing coordinated, interdisciplinary care to populations with complex social and medical needs, while taking into account their personal/cultural preferences. This goal is ultimately the reason why I'm passionate about addressing the operational, IT & policy issues that facilitate this type of care. It's been interesting how ever since Atul Gawande wrote his article about Hot Spotters, it's been much easier to explain my niche to other physicians & non-physicians. I consider myself a provider of geriatric palliative care for both ambulatory and long term care patients - having been fellowship trained in both disciplines at different institutions. I am lucky enough to be surrounded by plenty of geriatric colleagues, half of whom are palliative care trained. I see on a day to day basis the viewpoint shared by nurse Mary Poole in the previous comment. Many dedicated advocates for the elderly, and the medical community in general, have the misconception that palliative care is only for the dying or that palliative care is about limiting aggressive treatments. Yes, the definition has changed. Hospice may be for the terminally ill, but palliative care is for those living with serious illnesses - and palliative care is about matching treatments to the person's goals, not about choosing between palliative or aggressive measures. I've advocated for plenty of my nursing home patients to get surgical bowel resections to relieve serious strictures and obstructions so they can continue living with a decent quality of life, just as I have treated debilitating arthritic pain in seniors with no terminal diagnosis in my palliative care clinic. 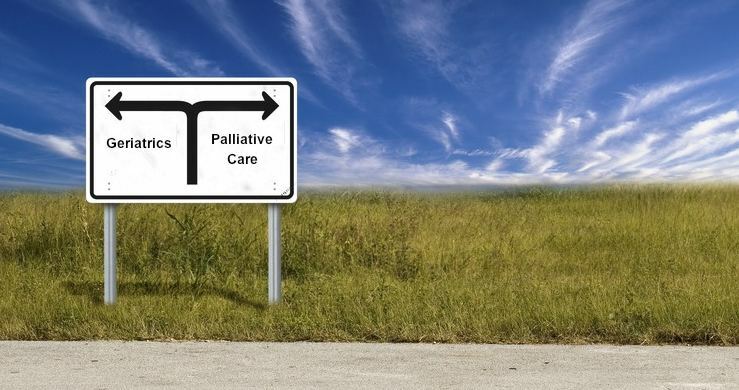 This misunderstanding about what palliative care is all about serves to drive the wedge in between our two disciplines and makes those of us dually trained feel like we have to pledge our allegiance to one versus the other. I say we keep our feet firmly planted in both fields so that we can educated our colleagues in both disciplines. there's plenty for both groups to learn from osteoporosis to methadone! 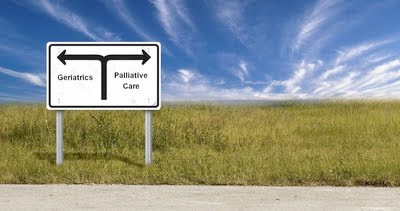 Being new to the area of adult palliative care, am I correct to understand that palliative care is a subspecialty which cares for all adult age groups? Was that always true or has palliative care evolved along with chronic illnesses. Thank you all for your sensitive, open and thought provoking comments. Your compassion is reassuring.